It's not the same thing every day. My parking lot abutted that of Burroughs Corporation which, at the time, was over one hundred years old and one of the largest computer companies in the world. Does anyone remember them today? We drafted our documents in longhand and passed them over to secretaries (sometimes in a secretarial pool) who typed them using a Wang system which saved the documents for future editing. I didn’t even mention that at the time General Motors had 40+% of the U.S. market share for new vehicle sales. In the mid-1990’s GWC Warranty Corp. was founded as Guardian Warranty Corporation. I’m proud to say that our company has evolved a lot in the 17 years since its founding. In fact, the pace of change over the past few years has been staggering, as we’ve expanded our talent, products, technology, even our office space. Consequently, we are rapidly growing and thriving in an ever more competitive market. However, we will NEVER rest on our laurels and stop changing. So buckle up and join us for an unpredictable but rewarding ride. Thanks to our friend and neighbor Natalie B., I recently devoured Child 44, the debut novel by Tom Rob Smith that came out a few years ago. 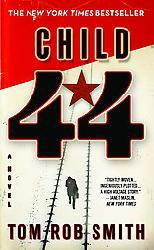 It’s a riveting murder mystery that unfolds in the shadows of the Stalinist Soviet Union of the 1950’s. In that terrifying, totalitarian world, a child murderer simply could not be acknowledged, lest it be seen as an indictment of the perfect order of the State. One fearless investigator, a seemingly broken man, risks the shreds of life he and his wife are clinging to in order to bring a killer to justice while racing against a state bureaucracy out to crush him. Simply spellbinding storytelling.